As a busy mom and yoga teacher I am always running around, teaching classes and clients, taking the kids to playdates, the playground, school, etc. I like to plan what I am going to make for lunch and dinner most days of the week. I usually make a big tray of roasted veggies, a protein (salmon, chicken, etc.) and a sweet potatoes or brown rice. Some days, though, I just don’t have time to prepare dinner for the kids, my husband and me. Shopping in NYC isn’t all that easy either with three kids in tow! I have to make sure I have some tasty meal options on hand for us that still tastes good and that I can store without going bad. As much as I love to cook; it’s so convenient to have meals on hand as well. As it gets closer to the summer and longer days, the boys and I like to spend more time at the park. When I can just pop something in the oven quick without having to prepare it when we get home, it makes life so much easier, especially when I have three hungry boys to please. 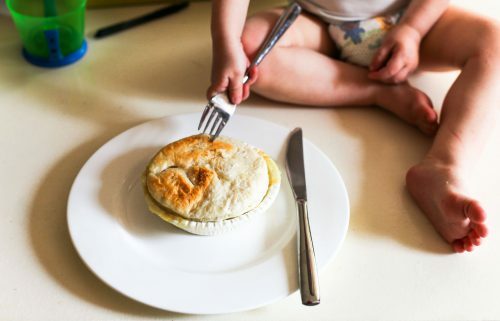 As a kid I loved having chicken pot pies for dinner. I remember coming home from school and my mom baking pot pies for my brothers and I for dinner. Blake’s All Natural Food was recently introduced to me, they provide meals made from scratch in small batches using treal ingredients. I love Blake’s All Natural brand messaging, they are committed to a simple idea that sharing great food and lively conversation shouldn’t require reservations, and shouldn’t be reserved for holidays. If Blake’s All Natural allows me to be able to spend ten extra minutes playing with my boys, then I will take every second of it. Blake’s All Natural also comes in a variety of flavors. My personal favorite is turkey shepherd’s pie because I love sweet potatoes! Timothy and the babies are a fan of the chicken pot pies, and my husband really likes the chicken and dumplings. The meals are rich and satisfying (my husband has no idea his favorite dish is only 320 calories). Blake’s even offers gluten free options. The farmhouse mac and cheese is delicious, as well as are all of the meals. You really can’t go wrong. You can’t go wrong when you feed your family healthy meals even if they aren’t from scratch. Blake’s All Natural meals make you feel like you’ve made a home cooked meal and allows you to save some time for yourself and kids. I can’t believe how affordable the meals are as well. Dinner time shouldn’t be stressful for us busy moms. When I find something that works well, I love to share it! The Ultimate Body Love Summit!